* Shockwave treatment is supported by NICE the Governments Health watchdog and current research reports success rates between 65 and 91% in reducing patient’s pain and symptoms after a course of 3-5 sessions. 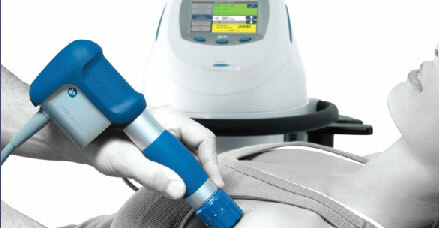 There are very few adverse effects which make Shockwave therapy a very compelling therapeutic modality for the treatment of chronic tendon problems. Treatment courses are typically 3-5 sessions, each a week apart. Until recently, a course of Shockwave Therapy was an expensive treatment choice. It was only available privately and in only a few consultant lead clinics. Since 2012, we are proud to be one of the first physiotherapy clinics in Portsmouth to be able to offer this effective treatment at an affordable price. For more information on Shockwave therapy please call the clinic on 02392 374 220 and talk to one of our Physiotherapists. Or alternately click here to book an appointment. If shockwave therapy is not appropriate for you we will inform you of the reasons why and if appropriate advise you of the best course of action instead. In these circumstances our normal treatment fees will apply.